To separate and identify the amino acids in a mixture by thin layer chromatography. 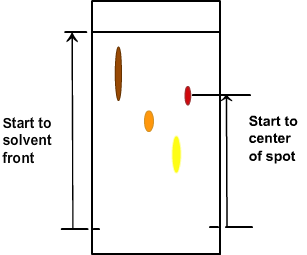 Chromatography is by far the most useful general group of techniques available for the separation of closely related compounds in a mixture. Here the separation is effected by differences in the equilibrium distribution of the components between two immiscible phases, viz., the stationary and the mobile phases. These differences in the equilibrium distribution are a result of nature and degree of interaction of the components with these two phases. The stationary phase is a porous medium like silica or alumina, through which the sample mixture percolates under the influence of a moving solvent (the mobile phase). There are a number of interactions between the sample and the stationary phase and these have been well exploited to effect the separation of compounds. Thin layer chromatographic (TLC) technique readily provides qualitative information and with careful attention to details, it is possible to obtain quantitative data. Thin layer chromatography is a technique used to separate and identify compounds of interest. A TLC plate is made up of a thin layer of silica adhered to glass or aluminum for support. The silica gel acts as the stationary phase and the solvent mixture acts as the mobile phase. In the ideal solvent system the compounds of interest are soluble to different degrees. Separation results from the partition equilibrium of the components in the mixture. In the simplest form of the technique, a narrow zone or spot of the sample mixture to be separated is applied near one end of the TLC plate and allowed to dry. The strip or plate is then placed with this end dipping in to the solvent mixture, taking care that the sample spot/zone is not immersed in the solvent. As the solvent moves towards the other end of the strip, the test mixture separates into various components. This is called as the development of TLC plates. The separation depends on several factors; (a) solubility: the more soluble a compound is in a solvent, the faster it will move up the plate. (b) attractions between the compound and the silica, the more the compound interacts with silica, the lesser it moves, (c) size of the compound, the larger the compound the slower it moves up the plate. The plate is removed after an optimal development time and dried and the spots/zones are detected using a suitable location reagent. An important characteristic used in thin layer chromatography is Rf value. The present experiment employs the technique of thin layer chromatography to separate the amino acids in a given mixture. All 20 of the common amino acids [standard amino acids] are a-amino acids. They have a carboxyl group and an amino group bonded to the same carbon atom (the α- carbon). They differ from each other in their side chains, or R groups, which vary in structure, size, and electric charge. The interaction of the amino acids with the stationary phase like silica varies depending on their 'R' groups. The amino acid that interacts strongly with silica will be carried by the solvent to a small distance, whereas the one with less interaction will be moved further. By running controls [known compounds ] alongside, it is possible to identify the components of the mixture. Since amino acids are colourless compounds, ninhydrin is used for detecting them. To identify this, after development, the TLC plate is sprayed with ninhydrin reagent and dried in an oven, at 105°C for about 5 minutes. Ninhydrin reacts with α- amino acids that results in purple coloured spots [ due to the formation of the complex - Rheuman's purple] [http://vlab.amrita.edu/?sub=3&brch=63&sim=156&cnt=1]. Rf values can be calculated and compared with the reference values to identify the amino acids. [The Rf value for each known compound should remain the same provided the development of plate is done with the same solvent, type of TLC plates, method of spotting and in exactly the same conditions].